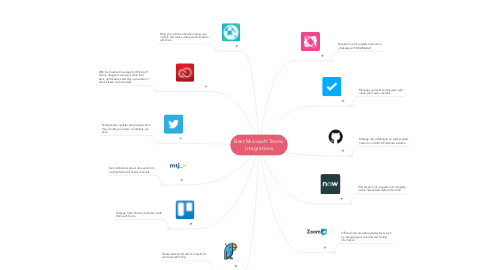 This mind map shows the best integrations for Microsoft Teams! 1.1. Brainstorm, plan projects and outline strategies with MindMeister! 2.1. Manage your tasks and projects right inside your Teams channels. 3.1. Send periodic updates about tweets from the accounts you follow or hashtags you track. 4.1. Find answers, file requests and complete routine ServiceNow tasks within chat! 6.1. Manage Trello boards and cards inside Microsoft Teams. 7.1. Create instant polls with live results for your team with Polly! 8.1. Bring your culture online by making your mission and values visible and actionable with Disco. 9.1. Get notifications about Jira events into multiple Microsoft Teams channels. 10.1. With the Creative Cloud app for Microsoft Teams, designers can easily share their work, get feedback and stay up-to-date on actions taken on their assets. 11.1. Manage and collaborate on code projects hosted on a GitHub Enterprise instance.